Tagged under Nitro+, Madhouse, Series. Takumi suffers from intense delusions as a result of his apparent schizophrenia and the extremely secluded lifestyle he lives as a hikkikomori. One day he accidentally stumbles upon a gruesome murder scene, a part of a chain of events called "New Generation." After this, his life gets caught up in these events, and he meets a bunch of increasingly insane girls with swords. I feel like this show was hard to root for. I really wanted to like it, because it had such great and interesting concepts, but I think the director failed to make the concepts work. It was all dumped on you, and rushed. I also feel that the show lacked an identity of what exactly it wanted to be. Was it a horror show? A harem? An action show? A psychological show? A show can be all of those and still be great, but here they just didn't connect them very well. Most of the show just seems like a plot dump, followed by school filler, then Takumi going from girl to girl just to talk about more concepts. The worst part is that there are only like 2 episodes left, and they are still introducing new concepts. talks about someone's illusions coming to life. It's actually quite morbid despite the art style. There isn't many episodes so it's a fast one to watch. but I didn't quite like the setting of multi girls with one useless guy. 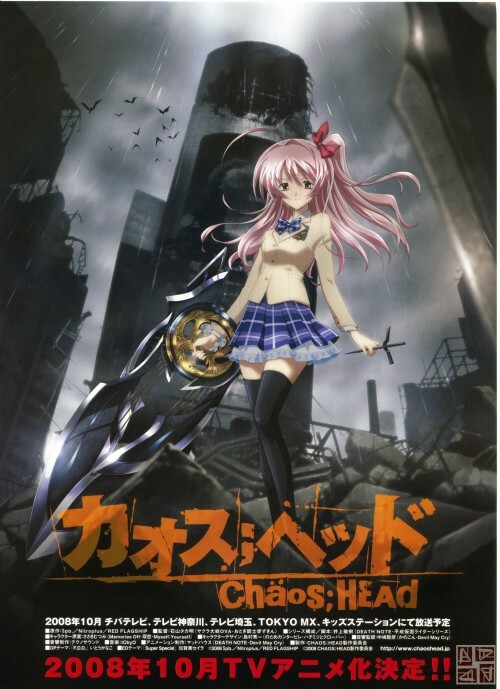 No feedback on Chaos Head.